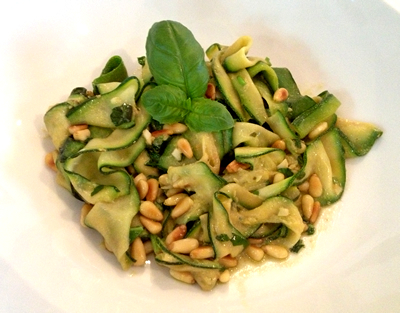 Courgette/Zuchini are a fab replacement for pasta and even quicker to prepare. If your pine nuts are not already toasted, get them going in a saute pan on a high heat. Shake them around regularly until browned and then transfer to your serving dish. Top and tail and then slice your courgette/zuchini lengthways with a vegetable peeler to create thin slices. Heat some olive oil in the pan on a medium heat and add the courgette/zuchini slices and garlic. Saute for a few minutes until the courgette slices soften a little then remove from the heat. Add the chopped basil, nutritional yeast or cheese to the pan and mix well. Transfer to your serving dish and toss with the pine nuts.